The MCL-NSOM is a fully operational near-field scanning optical microscope manufactured on Mad City Labs’ versatile RM21™ inverted optical microscope. 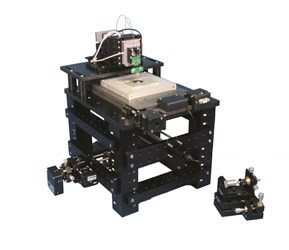 This instrument is designed to allow users to convert between NSOM, SPM, and fluorescence optical microscopy techniques. Building on the resonant probe SPM, the MCL-NSOM incorporates common elements such as the MadPLL® phase lock loop controller, and utilizes precision motion control with six axes of motorized positioning and three axes of closed loop nanopositioning. The microscope features a 635 nm laser excitation source, fiber launch, an oil immersion objective lens, a CMOS alignment camera, and an avalanche photodiode detector. It supports illumination, collection, illumination and collection, reflection, and reflection collection modes, while operating in aperture mode with shear force feedback. For more features and specifications on this scanning optical microscope, download the datasheet.